The first flight of the private Falcon 1, seen here in a static fire test of its Merlin 1 engine, is now slated for late March at the rocket's Kwajalein Atoll launch pad on the Pacific Ocean. Anotherspot on the calendar has been targeted for the maiden takeoff of the privatelybuilt Falcon 1 launch vehicle, designed and constructed by Space ExplorationTechnologies Corp. (SpaceX) of El Segundo, California. "Lookslike we are on for a March 20-25 launch window," said Elon Musk, SpaceX chairmanand chief executive officer. "We are also going to do another static fire to checkout the system about four days before launch," he told SPACE.com. Nextmonth's projected liftoff will take place from an equatoriallaunch site built by SpaceX at Kwajalein Atoll on the Pacific Ocean. Falcon1 is a two stage, liquid oxygen and rocket grade kerosene powered launchvehicle. The rocket's main engine iscalled Merlin, with a SpaceX Kestrel engine powering the booster's secondstage. Falcon's first stage is also rigged for a water landing under parachute,to be picked up by a ship in a process similar to recovery of the space shuttlesolid rocket boosters. Thepayload on the rocket at Kwajalein is the FalconSat-2,built by U.S. Air Force Academy cadets in Colorado Springs, Colorado. The$800,000 cube-shaped nano-satellite measures about 12.5 inches (32 centimeters)per side and weighs 43-pounds (19.5-kilograms). FalconSat-2is designed to gauge space plasma and is part of a program sponsored by theU.S. Air Force and the Defense Advanced Research Projects Agency (DARPA). FalconSAT-2was originally slated for launch aboard a space shuttle in early 2003, with theColumbia disaster scrapping that plan. Ina newly issued SpaceX update, Musk said that the tentative launchwindow for the maiden flight of Falcon 1 is March 20 through25. Early next month, the company will do a systems review of the boosterwith DARPA, the U.S. Air Force, and NASA. Gettingthe rocket off the ground will depend on several "gating items", Musk added,such as receiving a shipment of liquid oxygen - LOX - from Hawaii andswitching out the booster's second stage tank. "Obviously,long term operations on Kwajalein will require that we install astate-of-the-art, high reliability LOX plant on island," Musk said. Inthe meantime, Musk noted, the Falcon 1 launch team will work though thebooster's first flight with LOX shipments from Hawaii "and whatever output wecan generate from the sad, old clunker of a LOX plant that we currently own." Muskalso said that his rocket team is replacing the launcher's second stage tank,following discovery of a small leak. "Fortunately, a Falcon second stagetank just barely fits through the door of a standard cargo airplane...so theflight is relatively inexpensive and readily available." Fixingthe leak in the tank being shipped back is not a huge task, Musk advised, butalso not something easily done far away from the factory. Countdownprocedures have been modified to prevent such leaks from developingin the future, he explained. Falcon-1'slaunch debut has been long in coming. 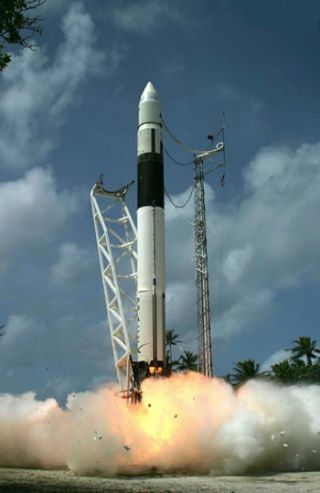 The SpaceX booster's first flight hasbeen delayedfor some two years by a myriad of bureaucratic, technical and logistics issuesafter the rocket's unveiling in December 2003. Musksaid that he expects the second launch of Falcon 1 to take place fromVandenberg Air Force Base in California about three to four months after themaiden launch. SpaceXwas founded by Musk in June 2002 - the third company founded by the successful,deep-pocketed entrepreneur. Previously,Musk co-founded and was the largest shareholder of PayPal?, the world's leadingelectronic payment system, which sold to online auction giant eBay? for $1.5billion in 2002. In 1995, Musk co-founded Zip2 Corporation, which sold toCompaq Computer Corporation for over $300 million.